Junior Morias opens the scoring for Posh against Oldham. Photo: Joe Dent/theposh.com. Peterborough United manager Grant McCann praised a strong second-half showing after his side beat struggling Oldham 3-0 at the ABAX Stadium today (January 20). McCann admitted he was glad to reach half-time level against a team who hadn’t won in their previous seven League One outings. Oldham's George Edmundson is sent off by referee Sebastian Stockbridge at Posh. Photo: Joe Dent/theposh.com. But he was delighted with his team’s response to a half-time tactical briefing as goals from Junior Morias, debutant George Cooper and Jack Marriott, from the penalty spot, moved Posh up a place to eighth in League One. Oldham were hampered by a red card for substitute defender George Edmundson midway through the second half. 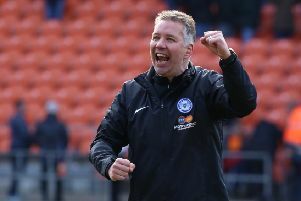 Posh remain three points from a play-off place, but defeats for fourth-placed Scunthorpe and fifth-placed Bradford City today has given extra encouragement to the chasing pack. “Last week we were chasing one play-off place,” McCann said. “But now we are chasing three places. “It changes every week and there are 18 matches still to go so it will probably change some more. All we can do is look after our own results and make sure we stay in touch. We probably need to stop acting on emotion after every result, good or bad. Posh debutant George Cooper celebrates with his own fan club at the end of the Oldham game. Photo: Joe Dent/theposh.com. “We weren’t great in the first half today. Oldham have some bright footballers and they were better than us in the first half. There is no point trying to hide that fact. “I was glad to get in at half-time all square and to be able to make some tactical changes. “And the response from the boys was terrific. I was delighted with the second-half performance. When we play at a fast tempo with aggression we are a match for anyone. That includes the teams at the top. “We still had to work hard and defend well at times. I was delighted for the back four, the goalkeeper, and for Anthony Grant to keep another clean sheet as they work hard on their defending. That work can go unnoticed because of all the talk about our attacking players. Anthony Grant on the ball for Posh against Oldham. Photo: Joe Dent/theposh.com.